Best Pet Odor Neutralizer, Pet Urine Odor Removal Products | NuKleen Inc.
Find the best pet odor remover, carpet cleaner, and more here at NuKleen® Inc. Without knowing it, we can spend hundreds of dollars trying to restore our carpets, upholstery, leather, and other surfaces only to end up with sub-par results! We offer you an amazing line of affordable, world-class products that feature the best odor eliminator and best carpet cleaner on the market. Our proprietary Tek 7 Enzyme Emulsifier Plus contains a unique blend of enzymes that penetrate the pores of fabric, rubber and even hard surfaces to eliminate odor naturally. Not sure which product to use? Consider trying our most popular products: NuKleen® Odor Free & NuKleen® Carpet N' Upholstery Cleaner. Odor Free is widely used as a pet urine odor remover and will remove cat urine smell forever that just won't go away! Carpet N' Upholstery Cleaner uses a heavily concentrated amount of Tek 7 Enzyme Emulsifier Plus to effectively lift and remove stains of all kinds and ensures quick drying time. Carpet N' Upholstery Cleaner and Odor Free are a dynamic product duo that are guaranteed to solve your pet odor removal needs, as well as any other hard to remove odor. Browse through our selection of 5-star rated products that will finally meet your needs, and you will quickly realize why our products are second-to-none. We have been in business since 1993, and we are so thankful for our incredibly loyal customer base that has continuously reminded us with their 5-star reviews that we have the best pet odor neutralizer/eliminator and carpet cleaner they have ever used. Our largest customer base is cat owners, as cat urine can be one of the most difficult odors to remove. 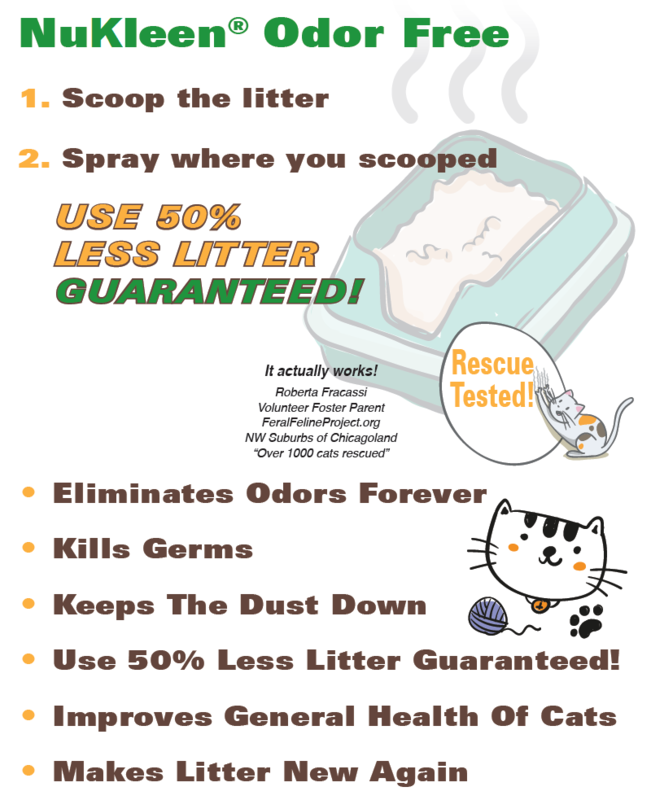 Odor Free will not only remove cat urine smell, but has been proven to eliminate any odor, including skunk. Whether you have a dog, cat, turtle, hamster, guinea pig, ferret, or any other pet that requires odor removal anywhere in your home, Odor Free is guaranteed to eliminate any odor left behind. Many of our customers have also shared that they store their Odor Free in their bathrooms to neutralize odors in between applications for their pets. Our second most popular product, Carpet N' Upholstery Cleaner, also maintains a 5-star review due to its unmatched effectiveness with stain removal. Whether you have pet stains, wine, oil, grease, rust, sharpie marker, ketchup, mustard, or general traffic stains, we have the best carpet cleaner available that is even used by commercial carpet cleaners and guaranteed to remove all stains. Carpet N' Upholstery Cleaner can be used on all types of carpet or fabric including wool, nylon, and other synthetic blends. All products we provide are best-in-class, including our NuKleen® N’ Seal carnauba wax, Leather N’ Vinyl cleaner/conditioner, Tire N’ Trim Renew, and Suds N’ Seal. These products can be used on your automobiles as well as the surfaces within your home or office spaces. Give our products a try today and let us prove to you why we are the best! Need help? Feel free to contact us at (866)-999-7677 and we'll help you find the right product! The Best Multi Purpose Car Cleaner is Right Here! THE BEST Odor Remover I've Ever Used!